Haruo, Adolfo Alix Jr.’s tale about a Yakuza member seeking to lead a new life in Manila, got the nod of the Young Critics Circle as the best film of 2011. Rodolfo Vera bagged the best screenplay award for Niño, a story about a once-elite family coping with inevitable decline. Other winners include Diana Zubiri for best performance in Bahay Bata, Señorita for best editing, Teoriya for best cinematography and visual design, and Ang Sayaw ng Dalawang Kaliwang Paa for best in sound and aural orchestration. The Film Desk of the Young Critics’ Circle will hold the 22nd Annual Circle Citations for distinguished achievements in film on April 19, 2012 at the University of the Philippines Jorge B. Vargas Museum in Diliman, Quezon City. YCC drew its selection from both regular and non-regular releases comprising the entirety of Philippine cinema output in 2011. Films considered for discussion were those that had three or more screenings before a paying or non-paying audience in any public venue. Thirty-five films were initially long-listed by the group, which was later narrowed down to a shortlist of eight. Only short-listed films earn the privilege to be nominated for any of the six categories. YCC does not confer nominations on artistic or technical merit if the film does not qualify in the short list. The organization departs from many conventions of other award-giving bodies both here and abroad in bestowing cinematic honors. For instance, the award for Best Film of the Year is reserved for the director such that no separate prize for direction is needed. The Best Performance award is most coveted as it is conferred on a screen performer whether male or female, adult or child, individual or as part of an ensemble, in leading or supporting role. To uphold a more dynamic and encompassing way of looking at films, technical honors refer to fusion of outstanding efforts in fields otherwise deemed apart. In this case, the Best Cinematography and Visual Design recognition covers both camerawork and art direction. Similarly, Best Sound and Aural Orchestration encompasses not sound engineering alone but musical score as well. Established in 1990, YCC is composed of members of academe who, through the years, have become attentive observers of Philippine cinema. Coming from various disciplines, they bring an interdisciplinary approach to the analysis of film. Current members are from the University of the Philippines, Ateneo de Manila University and De La Salle University. Members of the YCC include Eloisa May P. Hernandez (chair), Tessa Maria T. Guazon (vice chair), Patrick D. Flores, Eulalio R. Guieb III, Jayson Jacobo, Skilty Labastilla, JPaul Manzanilla, Jema Pamintuan, Choy Pangilinan and Jaime Oscar Salazar; on leave: Flaudette May V. Datuin, Noel D. Ferrer, Nonoy L. Lauzon, Eileen C. Legaspi-Ramirez, Gerard R. A. Lico, Jerry C. Respeto, Neil Martial R. Santillan and Galileo S. Zafra. I am the 3,941,710, 096th person to have been born on the planet, in a country with an average rate of 265 births an hour. The life expectancy for women in the Philippines is 71.3 years, slightly higher than males. The population of the Philippines is at a staggering 95 million in 2011 with the highest concentration in Metro Manila. These figures are dumbfounding and my disbelief turned to anxiety as I toggled between one population website to another to confirm our count. The immense concentration of people in urban centres like Manila is cause for alarm, as disasters like typhoon Ondoy showed us. Neither the traffic lanes nor the numerous high rise developments dotting the city can keep up with this relentless growth. In addition to my train commuting penance (in coaches with people stacked like hay or sandwiched like sardines in a tin can), there are public school classrooms that house close to sixty students in morning and afternoon intervals, entire shantytowns futilely cloaked by towering buildings, the exodus of the labor force, a dwindling middle-class – the list goes on in factual morbidity. Majority of those left behind thrive on elusive chance and the nebulous glimmer of hope, exploited by schemes of prospect and risk. This picture coincides with the workings of birth inside the Fabella hospital. Doctors and nurses deliver close to a hundred babies a day at Dr. Jose Fabella Memorial Hospital, a government-run hospital in Manila. 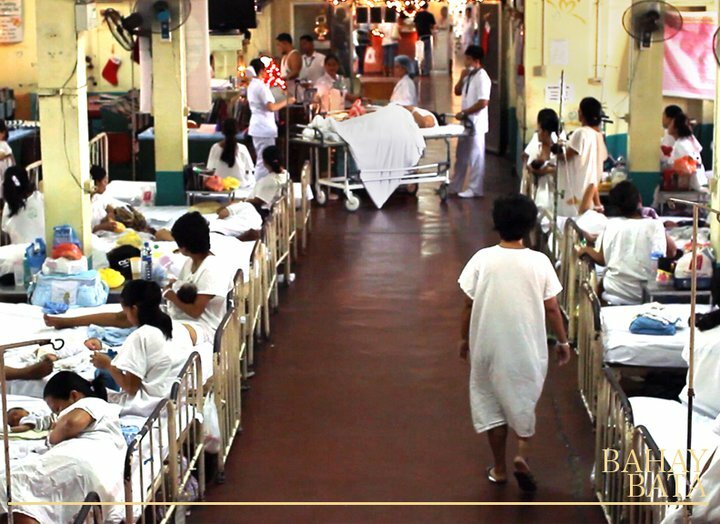 Bahay Bata takes us inside Fabella where this incessant number is proven by the interminable lines inside wards, delivery rooms, breastfeeding stations and corridors. The perpetual queues start at the nurse’s triage and culminate with those of husbands and relatives during visiting hours. In the opening sequence, eight women wait to be interviewed by the triage nurse, and numerous others linger, cued to labour pains arriving in close frequency. Up to when these women are shuttled into the crowded delivery room and posted to the hospital ward to recover, the film frame teems with bodies, voices and the means by which they are identified, numbers. In the recovery ward, women and their newborns are billeted two to a narrow, hospital bed. Our eyes and ears are assailed by voices urging women to push and breathe, cries of newfound life, ward chatter about husbands and families, the doctor’s barking orders and the nurses’ break time banter. Fabella is a world ordered by numbers, those called out by nurses during rounds, numbers announcing discharge or enforcing release. Newborn cries are supposed to be jubilant but here, they are tinged with dreary expectation. This world is framed for us through the pool of nurses on duty to attend to Fabella’s women patients, primarily through the eyes of Sarah, a young nurse stationed at the normal delivery ward. Nurse Sarah makes do with meagre resources in the hospital ward. When milk flow dries up, she calls on Cathy a young mother to supplement the supply. While director Eduardo Roy, Jr. allows us to view this overwhelming world of women birthing, he tempers its intensity by subtly weaving the tensions of the minute within a larger, ominous picture. Ward life is recorded in vignettes, women joking about ‘holding in’ the birth of their children because cash prizes were given to babies born on Christmas and New Year’s Eve. Adolescent girls chatter with delight about how they met their husbands and boyfriends while working breast pumps to feed their babies in incubators. Hospital staff drew lots for their forthcoming Christmas party, gleefully told that a cash prize awaits winners in the dance competition. We learn that Sarah is made pregnant by her married lover. While fellow nurses dream of rounds in a Canada ward, Sarah remains undecided about her application. Christmas is to come and the nurses bemoan the fact that they had been on Christmas Eve duty for two consecutive years. The hospital teeters in perilous order, its staff of doctors and nurses make do with inadequate supplies, slovenly mothers, delayed bonuses and abandoned babies. This state of precariousness stealthily drifts into nurse Sarah’s private world, adept though she is with ‘making ends meet’ at the normal delivery ward. She delays filing her application for the nursing post in Canada despite prodding from her mother and friends. She holds out for her married lover who eventually leaves her to go back to his family. Sarah is stricken with devastating loss, the realness of the wavering world that surrounds her at Fabella becoming palpable in her own life. The cries of babies become unnerving and the sight of a mother struggling to push is suddenly fearsome. Nurse Sarah struggles to accept her fate and released from her Christmas Eve duty, she trudges the hospital stairs and corridors with unseeing eyes. We will not know for certain if Sarah will keep her baby but we know her life will never be the same as she welcomes yet another year at Fabella. Or perhaps like Cora, a senior nurse demeaned by their head doctor we are unsure whether she, too is to ever come back. Numbers attain a foreboding presence in Fabella. Drawn as lots like fragile chances, called out and announced in cracking voices, tags that mark admission and discharge, numbers that make the shrinking, crowded space life has become for nurse Sarah, the adolescent mother Cathy who feeds others but unable to nurse her own because of a congenital defect; Melba who births her thirteenth child and still refuses to be ligated because her husband said so; Rose who gave birth to a baby with cord coil and so doing endangers her life, Tess, a prison inmate whose cuffed hands bars her from holding her child, babies suddenly abandoned to be picked up by DSWD. Names float in random chaos across Fabella and their resolute presence in this cramped laboratory of uncertain futures hem us in with stark precision. It is striking that Bahay Bata adopts the tone of a documentary and knits it with a story told with biting humor and a rare subtlety. Other films cast deprivation in an ‘other/nether-worldly’ manner, paradoxically reversing realities which filmmakers initially set out to capture. We are confronted with sequences of crippling poverty, and their stark crudity endows us with paralyzed detachment. On the other hand, Bahay Bata exhibits a desire to get to the heart of the matter and does so inventively. Coupled with sound and image, the numbers and their exactitude conjure trepidation. Bahay Bata couches the hard truth within a story of frailty and weakness, leaving out the moralizing yet urging us to reflect where falsity truly springs from. How can we morally espouse a just world for children, or preach the very sacredness of life when the very conditions we harbour one that reeks of injustice and hunger we adamantly ignore? To have children is to summon courage and somehow fear the future, even for women who did not birth children in Fabella. That future remains greatly precarious for mothers, their children and entire families as long as women are unable to make informed choices about their bodies and ultimately, their lives. Tags: Bahay Bata review, Eduardo Roy Jr. Criticism interrogates. It interrogates our individual and collective experiences with meanings. There are meanings that detain us in the prisons of our oppressors, and there are meanings that tell us which truths are more preferred under the contingencies of our present struggles. The challenge of criticism is to know the co-variances, similarities and differences between and among meanings, to know how to untangle the hidden power of meanings, to know how power is ensconced in those meanings, to know how that power can be unleashed to bring our social lives closer to the world we are redreaming, and to use that power to birth the possibilities of a just future into the present. Criticism allows us to create new metaphors that speak of the turmoils of the present. It is always provocative, for to be complacent about the colonization of our empirical and imagined realities by unjust discourses and social practices is to invite tyranny and oppression. Criticism shatters. It shatters the shibboleths of our silenced lives, the deep silences about the wrongs of society. To challenge those silences has often come to mean courting tragedy. Criticism challenges those silences. It breaks silence free from its silence. It proffers breakthroughs that break down debilitating silences, and, in the process, rejoices in the breakdown of unwanted silence. Criticism is not about answers. It is about questions. The aim of criticism is to offer sheaf after sheaf of provocative questions that negotiate the terrains of the wrongs and the wronged, and the wrongdoers. Why is there too deep a silence about the wrongs of society? Perhaps, because we have been comfortable with the answers – and have been too negligent to ask. To be comfortable with answers is again an invitation to the discomforts of a morbidly terrible silence. Criticism is about asking. It is not enough to have answers, no matter how approximately true the preferred truths to those answers come out to be. Answers should continually take the form of questions. Criticism asks questions that attempt to bring life back to life. That is why criticism is a celebration. We feast on questions that can tear to shreds the chilling comforts of silence and the discomforting decadence of our silenced lives. Criticism is a festival. It celebrates provocations, welcomes incitement, agitates the world. It is a festival that celebrates war against those who lacerate the soul of the unjustly wounded. Criticism fortifies the collective heroism of our anonymous revolutions.